You want to know what’s really interesting, from a statistical perspective? Evidence of real change. For a pitcher, maybe it’s a new pitch, or a change in velocity. For a hitter, maybe you’re talking about a new swing. Some years ago, I remember getting excited about Michael Saunders in spring training. It wasn’t that his numbers were good — it was that he was showing in-game power to the opposite field, which he’d never really done before. That seemed like a real thing, and sure enough, Saunders became an actual decent big-leaguer. You follow? Yeah, you follow. And, while you’re following: Monday, in Kansas City, Mike Moustakas hit an opposite-field home run. It’s considered to be his first-ever opposite-field home run. This is the kind of thing that draws my attention. If you want to know what I’m willing to care about in the early going, an easy answer is firsts. 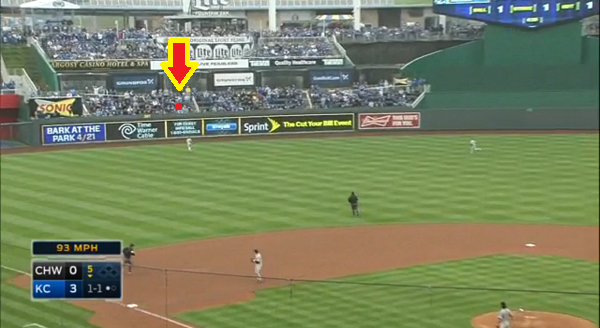 This much is inarguable: Moustakas had not before hit that kind of home run. Not in the major leagues. He’s been an extreme pull guy, and he’s seen an extreme amount of shifts. He’s always copped to being what he’s been. Moustakas has admitted that he thinks his power is to right and right-center, and that’s what the numbers have shown. Moustakas, also, has been a career disappointment at the plate. Which makes this particularly interesting. Moustakas won’t turn 27 until September. For those who refuse to give up hope, it rings some bells to see Moustakas go deep to left. Could this be a promising indicator? Has Moustakas, as he enters his prime, figured out how to use the whole field? You have to understand how little Moustakas has done. It’s not just that this was his first opposite-field homer. It was but his 13th opposite-field extra-base hit. In each of the previous four years, he hit three opposite-field doubles. His single-season high for opposite-field wRC+ is 34. His career split for opposite-field wRC+ is 12. Remember, a league-average wRC+ is 100. A bad wRC+ is 80. Moustakas, to left field, had a wRC+ of 12. Sixth-worst in baseball, since 2011. Brian Dozier, amazingly, is at -12, but then Dozier’s been better about pulling the ball with authority. Dozier’s game isn’t a hard one to figure out. Anyway. I’m no Dan Farnsworth, and I’m unwilling to pretend to be Dan Farnsworth, and he’s the resident swing expert. All I can say is you see some adjustments in the front foot, getting quieter over time. Against Samardzija, the foot barely came off the ground. Maybe there are also other differences in the swings. But all the swings hit the ball fairly well toward left. Monday, for the first time, Moustakas lifted one of those baseballs over the fence, but that doesn’t mean he wasn’t capable of it before. It just means it didn’t happen for him, over a few hundred opportunities. 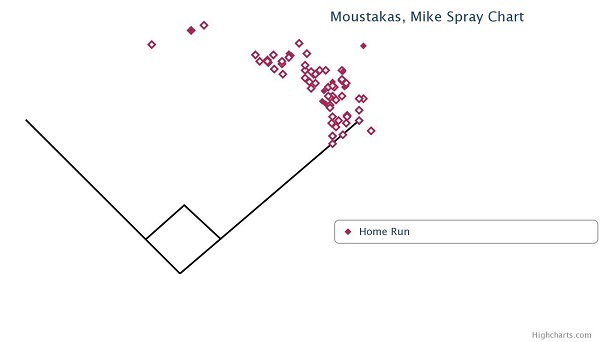 This spring, according to the data, Moustakas pushed 28 balls off the bat. He pushed 31 over the three previous springs combined. While I don’t know exactly how reliable the data is, I assume it isn’t just being made up, so this seems like a real thing, a real strong attempt by Moustakas to get better the other way as he shifts to hitting second. Using every field is sort of the hitter equivalent of a pitcher polishing his changeup — for most it’s forever a project, and it seldom reaches completion. But now Moustakas bears watching. In Arizona, it seems like he was hitting the ball the other way a lot more. And in the first real game of 2015, Moustakas went out to left field for the first time ever. So Royals fans can be excused for getting maybe a little too far ahead of themselves. Too early to say if this keeps up. Too early to say if Moustakas is able to balance hitting to left with pulling to right. If he ends up getting shifted less but also taking away from his own power, maybe it won’t be worth it. But, maybe it will. Moustakas has always been a decent pull hitter. If he’s not a zero the other way? Why, that would be a player you don’t have to be ashamed of. That would be a player for whom it finally clicked. Players like this are always dropping little teases, which makes them uniquely frustrating, but for Moustakas, this tease, at least, is unlike any other yet. We hoped you liked reading Mike Moustakas Hit One Out to Left-Center by Jeff Sullivan! Moose also had an infield hit the opposite way yesterday. Granted it was a squibber against the shift, but still…wouldn’t the old Moose just hit it right into the shift?